I would like to dedicate this blog to Professor Lauri Koskenniemi (June 19 1920 - November 11 2009) whose lectures on the history of Early Church in the Faculty of Theology of the University of Helsinki were truly unforgettable. Writing about Saint Perpetua and Saint Felicity causes in me some trepidation for their story is so special even in the Church of Christ full of exceptional life stories. The passion stands out among the myriad of stories about holy martyrs in its authenticity, simplicity and the mysterious presence of the Shepherd taking care of His lambs. The true focus is not in the faith and courage of the noble woman and her slave but in Jesus Christ who is working so actively in this particular case. 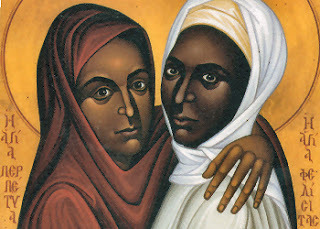 Holy Spirit has made it certain that the memory of St Perpetua and St Felicity will never disappear from the Church of Christ and has arranged the amazing thing that we can hear Perpetua's own authentic voice from the distant past and from the border between paganism and early Christianity. Trepidation, for I am truly worried that my inadequate language, inapt choice of words, misunderstandings or my ignorance of facts may distract readers of this blog from the heavenly brightness that shines in this unique, rare, utterly genuine and so powerful document telling about the love relationship between Jesus and His own from the frontiers of the Kingdom of Heaven. The story is in a category of its own and while wishing to draw attention to it my prayer is that the Holy Ghost would guide the writing so that my errors and mistakes would be minimized and the true meaning of these wonderful and awesome happenings would shine pure light of Grace. Blind Helen saw the brightness of the face of Christ and a strange new dimness covered the things of earth. So it is with the story of the young Carthagean woman Perpetua and her slave Felicity who met Jesus and the brightness of His face made everything else strangely dim. The story is at the same time awful, a kind of Sophie's choice, and marvelous beyond words. For your Christianity is about you and Jesus Christ. A very personal thing. The passio of Saints Perpetua and Felicity gives us a rare look at this most intimate relationship in the hearts of human beings. "Anyone who loves his father or mother more than me is not worthy of me; anyone who loves his son or daughter more than me is not worthy of me." Only gradually we realize that the command in the Law of Moses "Love God more than anything else" is actually God's love towards us. But it is awesome love that is stronger than death. Seriously. Jesus does love us but He also expects to be our Number One. Holy martyrs always had a choice to deny Jesus and to live happily ever after on this earth as normal humans with the gifts of life God gives us all, good and bad. Holy martyrs witness by their blood that this world is not what Christianity is about. Serving those in need, feeding the hungry, visiting prisoners and sick, contributing to world peace are all good things and something that God wants and has intended for us. But in certain extreme cases and especially in Christian martyrdom it comes down to the fundamental fact - Christianity is about you and Jesus Christ. There are martyrs in other religions, Judaism and Islam and many others, were people die for their faith and are praised for their endurance, courage and strength of belief. For Christian Church martyrs were the seeds from which it grew around the Roman empire during the horrible persecutions against the new religion. The story of Saints Perpetua and Felicity demonstrates why they were so significant and why the blood witnesses were essential in changing the hearts of those witnessing their torture and killing. Let us listen to her voice and rejoice together with her for getting to see the face of Christ, our Shepherd. The resource blog contains reference materials, including documents, archaeological and historical information and other data relevant to the story of St Perpetua and her friends. In gloriam domini nostri Iesu Christi!